The above passage describes a performance of Mugham (pronounced Moo-gham), a type of Azerbaijani folk music and a unique tradition practiced across Azerbaijan and the Middle and Far East. It contains characteristics of Iraqi Maqam, Persian Radif, and the Turkish Makams. Mugham is a very complex, particular style of music that requires knowledge of many qaydalar, or rules. While rules define the key, tonal scale, and structure of the music, the performer’s improvisation adds the color, flavor, and emotions which make each performed piece one-of-a-kind and breathtaking. A true master of Mugham can both improvise and adhere to a highly nuanced set of rules. There are several ingredients to this art: the musical instruments used during each of the performances and the poetry. The three key instruments used in this type of musical expression are the kamancha, a four-stringed, spiked fiddle, the tar, a long-neck, lute-shaped plucked string instrument played in the horizontal position, and the gaval, a type of a large tambourine. The poetry, the second ingredient, supplies each Mugham piece with lyrics. This is usually classically written poetry, such as gazal or bayati, which features recurring themes such as love, mysticism, sorrow, and pain. Each piece is based on a typical melodic model with different combinations, and each of the performances or improvisations might last from half an hour to several hours. In 2003, Mugham was recognized as a “Masterpiece of Oral and Intangible Cultural Heritage of Humanity” by United Nations Educational, Scientific and Cultural Organization (UNESCO). Not surprisingly, Azerbaijan’s First Lady, Mehriban Aliyeva, is UNESCO’s Goodwill Ambassador for oral and musical traditions. And when, in 2009, the capital of Azerbaijan, Baku, was named the World Capital of Islamic Culture (http://www.baku-icc-2009.az/), this unique musical style began to draw lots of attention. In March, 2009, an international Mugham festival called “Space of Mugham” was held in the capital for ten days (17- 27 March). The festival attracted masters of Mugham from all over the world and allowed them to demonstrate their talents and share their styles. In addition to the Festival, another result of the First Lady of Azerbaijan Mehriban Aliyeva’s efforts was the construction of a new Mugham Center in the heart of Baku. The center was completed in 2008. It features a 350-seat concert hall, club, restaurant, classrooms, and recording studio. During the opening speech, the President of the Republic, Ilham Aliyev, took great pride in saying “… I hope that the sound of our Mugham will fill this beautiful building and that our young performers will show their technique in this building”. Given that Mugham is one of Azerbaijan’s musical styles, it is also not surprising that one of the most famous Mugham soloists, Alim Qasimov, is actually from Azerbaijan. Qasimov gained his international reputation for his distinctive Mugham performance style and ability. He has given performances all over the world and won such prestigious awards as the UNESCO music prize (1999). 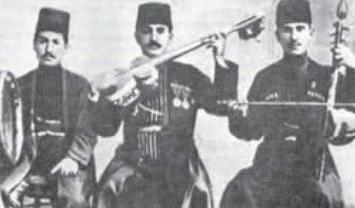 There are other musicians who are also known for having their own unique improvisation styles - Agakhan Abdullayev, Mansum Ibrahimov, Melekhanim Ayyubova, Sakina Ismayilova, Nuriya Huseynova, and Zabit Nabizadeh - all of whom were in attendance at the International Mugham Festival in Azerbaijan in March, 2009.
n 1908, famous Azerbaijani composer Uzeyir Hajibeyov based one of his renowned operas, “Leyli and Mecnun”, on Mugham, thereby creating “mugham opera” for the first time. His other masterpieces of integrated style include “Mashadi Ibad” and “Koroglu”. Another Azerbaijani composer of later years, Fikret Amirov (1922- 1984), introduced Mugham for symphonic orchestras (symphonic Mugham). In 2008, Azerbaijan’s representative in the Eurovision song contest, the group Elnur and Samir, also performed a piece which was influenced by elements of Mugham. Thomas Goltz, an expert on the region and author of “Azerbaijan Diary: a rogue reporter’s adventures in an oil-rich, war-torn, post-Soviet Republic” (1998), produced a 15-minute documentary about Mugham which won an Award of Merit in the short film/documentary category at the La Jolia, California 2009 Accolade Film Festival. The short film followed a musical group, “Qadim Sharq” (Ancient East), on its road trip across Montana. “It is a delight to be explaining Azerbaijani art and culture as opposed to war and political collapse,” said Thomas Goltz, commenting on the documentary. Be it because of a love for art, an interest in different cultures, or pure inspiration, listeners continue to be attracted to Mugham which is growing in popularity across the world. And even as Baku nears the end of its 2009 year-long tenure as Islamic Capital of Culture, it seems we certainly haven't heard the last of this special craft.